Let’s not go overboard with this Trump stuff! It has certainly become the talk of the town with some of the latest polls showing that Donald Trump is leading Hillary Clinton in a hypothetical 2016 matchup. 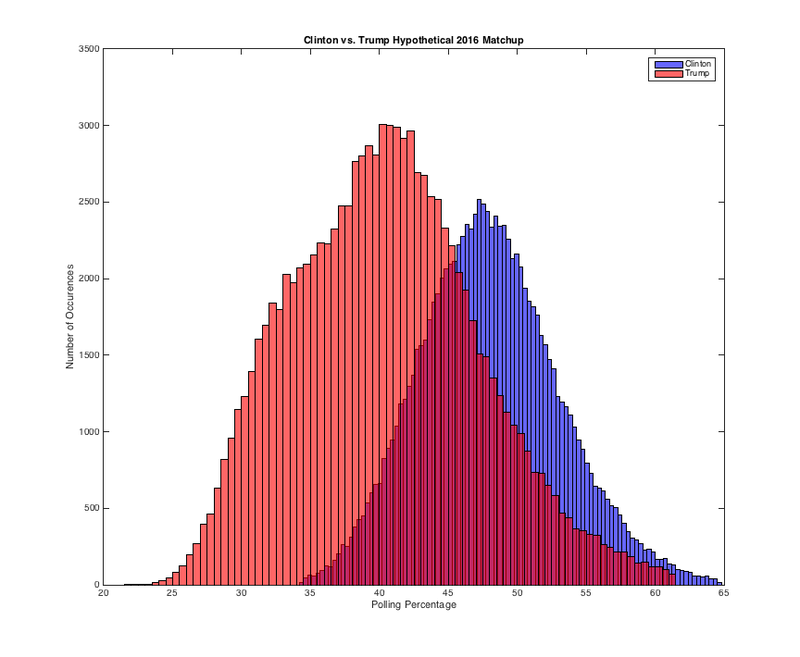 I decided to run my polling algorithm to simulate 100,000 election matchups between Clinton and Trump. I calibrated my model using a variety of data sources. I think in the era of the 24-hour news cycle, too much is made of one poll. Posted on September 11, 2015 September 11, 2015 Categories Data Analytics, Data Science, Elections, Mathematics, Politics, StatisticsTags Democrats, Donald Trump, Elections, Hillary Clinton, Politics, Republicans1 Comment on Let’s not go overboard with this Trump stuff!